To Sum It Up: The year is 1918, and Annie Browne is twelve years old. Having just moved to a new school, Annie is worried about making new friends. But on her first day, Elsie claims Annie as her best friend. In no time at all, Elsie has Annie isolated from and disliked by all their classmates. Annie struggles to extricate herself from Elsie’s clutches and joins her fellow classmates in alienating Elsie. However, as the Spanish Influenza takes hold of the country, Annie and her new friends must face the consequences of their cruelty. Review: I love my historical fiction! One for Sorrow not only successfully captures the feeling of the setting, but it supplies the reader with a delightful ghost story. Mary Downing Hahn creates an almost Gothic tone within her story, but she also keeps the book from becoming too far removed from younger readers. It is clear that Hahn is a well-seasoned writer. One for Sorrow is well written without becoming unrelatable. That being said, Hahn is well aware of her audience (younger readers), so while I found this book enjoyable, a younger reader would probably take more away from this story. I thought the pacing was excellent, making this a very quick read. I did, however, find it somewhat predictable. Taking into consideration the intended audience, this wasn’t really a problem, and I found it did not detract from the overall success of the story or my enjoyment of it. I found all of the characters to be very realistic. Hahn’s knowledge of her intended audience is clearly shown in the portrayal of her characters. The children in the story truly act their age. Therefore, her characters were relatable, but not always likable. I thought Annie and Elsie were particularly selfish and self-centered, but sometimes kids their age can be. As a reader, I think keeping this in mind helps to prevent you from judging the characters too harshly. 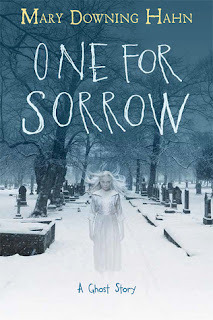 All in all: One for Sorrow was an enjoyable read and I think Hahn is a remarkable writer. However, I do think this book is best suited to readers of similar age to the characters (about twelve years old).